For the latest Storybus Tour organized by Hollywood, Health & Society, this was a mission to learn about climate change from some of the world’s top scientists and engineers at the NASA-JPL complex just northeast of Los Angeles. Through these signature series of research trips, HH&S offers writers and producers real stories about real people and places—unusual, compelling and dramatic—from climate scientists, other experts and community members on the ground. “Stories are more compelling when they’re more realistic,” HH&S Director Sandra de Castro Buffington told the group during the nearly hour-long ride from the Writers Guild of America, West building. TV storylines about climate change are still “not sizable—they’re close to zero,” Buffington added, referring to a 2012 HH&S TV Monitoring project that looked at more than 3,300 storylines on the top 28 scripted TV shows. It found that only 24 storylines—less than 1%—dealt with climate change, and most of them only peripherally. Out of the 24, 12 focused on extreme weather, 11 made mention of sustainability themes, and 1 was about the health effects of climate change. Setting the scene for the tour was Michael Gunson, JPL’s global change and energy program manager, who delivered some opening remarks to the writers before they arrived at the gate to the JPL campus in the foothills of Pasadena. Climate change, he told the writers, manifests itself in water. Will it create more cloud cover, and how would that affect weather patterns? Will there be more rain? Would the oceans’ evaporation rate increase? The effects on the planet are global, but Gunson really got the writers’ attention by bringing the impact of climate change much closer to home: Los Angeles may be running out of water. “The truth is, water isn’t where we used to find it,” Gunson said, explaining that warmer weather has made the snowpack in the Sierra—so vital to the region’s water supply—migrate to higher elevations. “It’s the big issue facing L.A. in the next five years,” he said. “We’re seeing climate change effects here on a day-to-day basis.” A period of dry winters—even one—could have profound implications on the overall supply and how it would be divided among the many competing and thirsty users—from the farmer growing his crops in the Central Valley to the homeowner trying to water his lawn in Los Feliz. Like many other scientists, Gunson dismissed the many ideas that fall into the category of “geoengineering”—some of them called potentially catastrophic—for counteracting climate change through the deliberate manipulation of the environment. There are proposals for iron fertilization of the oceans to remove carbon dioxide from the atmosphere; other ideas call for shading the Earth by floating sunlight reflectors in space, or dispersing chemicals into the atmosphere. All of them, Gunson said, are a poor substitute for the one action that needs to be taken: the immediate reduction in the use of fossil fuels for our energy needs. The Left Field room is a special spot at JPL, with whiteboards full of equations and notes along one wall, and toys and other props in cubbies that were lined neatly along low shelves. It was a place where any kindergartner would have felt at home, but some of the top scientific minds in the world come here to think “out of the box” and refine their ideas. Once at JPL, the 14 writers were broken into smaller groups and immersed in a table round-robin of stories and various scientific studies related to climate change. Each station had a pair of scientists or other specialists who discussed everything from global warming’s impact on the Amazon and other forest ecosystems to potentially new sources of sustainable energy from microbes living inside termites. The wealth of experts included Josh Fisher, Simon Hook, Eric Fetzer, Sassan Saatchi, Erik Ivins, Jared Leadbetter, Dan Goods and Laura Faye Tenenbaum. Saatchi’s personal background seemed to exemplify Buffington’s reminder to writers about how local storytellers could be a great source of inspiration for their creative process. With his thick glasses and deep, wide-ranging expertise on the subject of terrestrial ecosystems, Saatchi seemed to step right out of central casting. As a boy growing up in Iran, Saatchi’s future path was set after reading National Geographic magazines about expeditions to far-flung places. “It all seemed so adventurous,” Saatchi told the assembled writers. He studied math, engineering and physics, but then spent 20 years in the Amazon because he loved the thrill of exploring. Listening to him, one couldn’t help but think that there was an Indiana Jones somewhere deep down inside. For the writers on hand with experience in children’s TV programming, such as Chris Nee (Doc McStuffins), Maria Escobedo (Go, Diego, Go!) and Chuck Tately (Curious George), Saatchi’s comment on the need to reach and teach children about climate change fell on receptive ears. Educating the kids “would make our life [as scientists] so much easier,” Saatchi said. One of the tables—which featured Goods and Tenenbaum as the speaking guests—was situated in the Left Field room, a special spot at JPL with whiteboards full of equations and notes along one wall, and toys and other props in cubbies that were lined neatly along low shelves. It was a place where any kindergartner would have felt at home, but some of the top scientific minds in the world come here to think “out of the box” and refine their ideas. A visual strategist who graduated from Art Center College of Design, Goods takes sometimes complex scientific ideas and develops creative ways of envisioning them. His Juno installation tries to imagine what the atmosphere on Jupiter is like, with its heavy cloud cover and enormous lightning-filled storms. Tenenbaum, an instructor of oceanography at Glendale Community College, is an education specialist for the climate communication team at JPL. Her mission, which she detailed in a blog that she wrote for the NASA website Global Climate Change, is to make Americans science-literate citizens, something that’s key when trying to convince a lot of people that global warming is real. Following the table talks, the writers regrouped for lunch and a presentation by Marc Rayman, chief JPL engineer for the Dawn interplanetary space travel mission. Later, back down to Earth, they listened as Doug Ellison, a visualization producer at JPL, showed them how an armada of tracking satellites take the planet’s vital signs in real time, measuring everything from air temperature to ocean and ozone levels—even gravity. Then it was on to a tour of the JPL museum in the von Karman Visitor Center and the mission control room with Randii Wessen, deputy manager of project formulation, and flight operations engineer James McClure. After a short walk across the JPL campus, Wessen gave the writers another special treat: on an enclosed patch of land, a working duplicate of the Mars rover Curiosity slowly made its way over a rocky landscape that served as a stand-in for the surface of the red planet. Here, software for exploring Mars is tested on one machine before being uploaded to the actual Curiosity millions of miles away. What did the writers come away with at the end of their visit? Perhaps a rediscovered appreciation of the big blue marble of a planet that they call home, and a new awareness that science— despite its undeserved reputation for being boring—could actually be exciting. 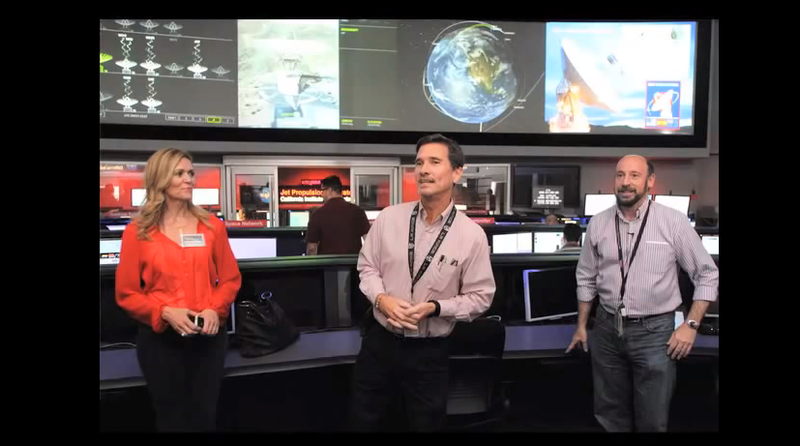 “Today’s tour of JPL was amazing and very eye-opening,” said Spiro Skentzos, a story editor for the NBC show Grimm.